I really love root beer. I love how the bubbles always go up my nose when I drink it. I love how it seems to taste like summer - all care free and child like. 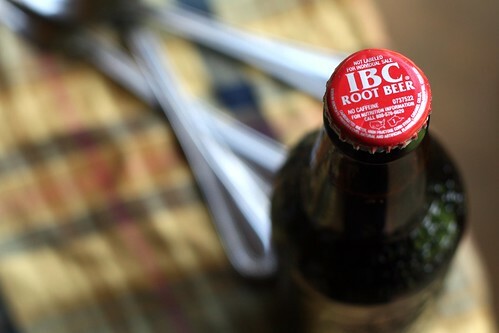 I remember drinking it as a kid, always IBC. I didn’t even know any one else made root beer for the longest time. But I’d never thought of putting it in a cake before. It’s kind of crazy when your batter fizzes as you stir it. While you don’t really taste the root beer in the cake, you do in the frosting. It’s probably one of the most delicious frostings I’ve ever made. All chocolatey and root beery. And the cake is so, so moist, it’s a super good chocolate cake with a twist - you can’t really identify it. I think I’m going to have to make a cream soda cake next. Preheat even to 325 degrees F. Spray the inside of a 10-inch Bundt pan (or 2 round cake pans) with nonstick cooking spray, or butter generously and dust with flour, knocking out the excess. Pour the batter into prepared pan and cook for 35-45 minutes (or 25-30 minutes for 2 cake pans), rotating the pan halfway through baking until a sharp knife inserted in the center comes out clean. Transfer to a wire rack to cool completely then loosen edges with a butter knife and turn out onto a cake plate. In the bowl of a stand mixer, or using an electric hand mixer, beat softened butter and cocoa powder. Once combined add the melted chocolate, salt, powdered sugar and root beer. Beat together until smooth. Spread on top of cooled cake. Slice and serve with vanilla ice cream. looks yummy. I recently saw a recipe similar to this only they were using gingerale- sounds good to me! Both the frosting and the cake look great. 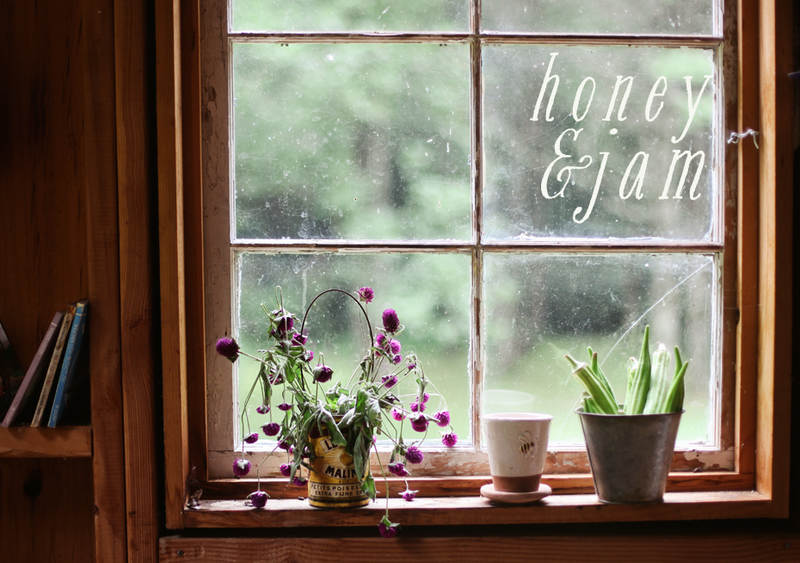 I loove both root beer and cake so will have to keep this recipe on hand. I just have to try this it sounds so delicious! Looks and sounds absolutely scrumptious, and I'm sure it tastes just as wonderful! 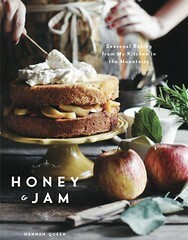 Oh Hannah this looks and sounds amazing! I LOVE root beer! Im saving this to try :) thanks! Awesome!! This is one of the recipes from that particular book that I've been eying up simply because it seems like a weird combo. We don't have root beer in Britain so I've no idea whatsoever what it tastes like, but I have made a chocolate coca-cola cake and a chocolate guinness cake before - is it the same sort of idea? This looks amazing, especially with the frosting! This looks absolutely decadent. I've been meaning to make a root beer cake or a cola cake for a while now. I definitely have to get cracking at it soon. Root beer and chocolate are a marvelous combination. I adore your idea for a cream soda cake too! Yes, this cake is AWESOME! I made it for a Memorial Day BBQ, and even a picky 6-year-old asked me to make it again! 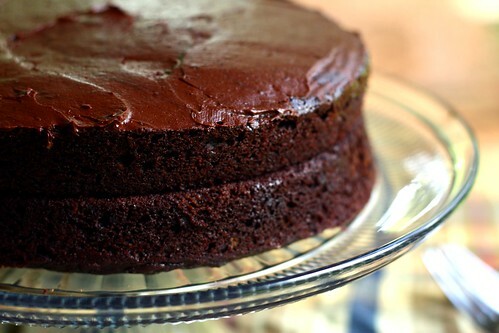 It is definitely chocolate-y and very moist. Great post! LOL!! My word verification is VAGGEFA? What in the world? If I wasn't afraid I'd eat the entire cake, I would make this. 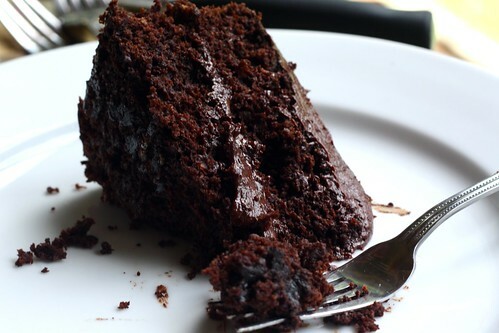 It looks so moist in your pictures, nice work! sounds delicious!!!! your pictures are always so beautiful! I convinced my mom to make this! Hopefully sometime this week!! I've nominated your wonderful blog for the Kreativ Blogger Award! in the frosting...the two oz. of 60% cocoa, did you mean chocolate, or cocoa powder? Honestly I'm not a fan of chocolate or root beer but I'd be ALL over that cream soda cake. Awesome! Totally going to try this one. :-) Root beer is the best soda EVAR! ooh, I'm so excited to try this! My son is allergic to dairy--I wonder if I could sub vegan margarine for the butter? I figure it's worth a try--sounds delish! thanks for the recipe! I made this for my mom's birthday today and surprised her and her coworkers with it. It was a hit - delicious! aimee: i've never worked with vegan margarine but i think it would work! 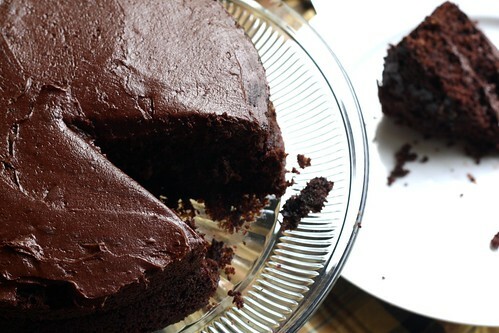 how delicious it looks this amazing cake, I am so excited to know how to prepare this, I think that I will say to my wife to make it and I know with this chocolate cake all we are going to be happy eating it.